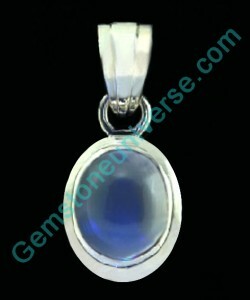 This particular blue moonstone is of Indian origin and is an oval cabochon cut with phenomenal adularescence. Blue Moonstones are phenomenal gems and exhibit adularescence. These are gemstones of feldspar group and have a turbid transparency. When light moves across this surface, the moonstone displays a soft mobile blue reflection, which in the nonprofessional’s parlance is referred to as blue sheen. One can easily distinguish the imitations from authentic moonstone – the blue sheen/ adularia of the authentic moonstone is mobile and not just confined to the dome of the cabochon. Also, the imitation is likelier to be more milky in appearance. Blue moonstone, also known as the chandrakant mani in Hindi is the upratna or the substitute gem for harnessing the energies of Moon/ Chandra. 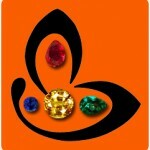 It is used as a substitute gem for natural pearl. It is a gem well recognized and used extensively for by the ancients.